← July: Knitting and Binary! First I have some pieces that will eventually be a baby afghan. 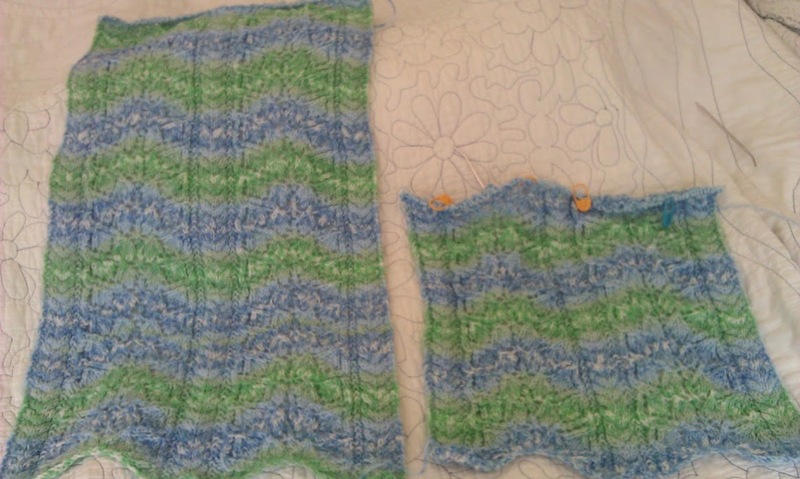 I don’t have children, and frankly don’t really know what I’ll do with it when its done, but I just liked the designs and was given some children’s weight/color yarn. So these are my edges based on and a wheat ear cabling. 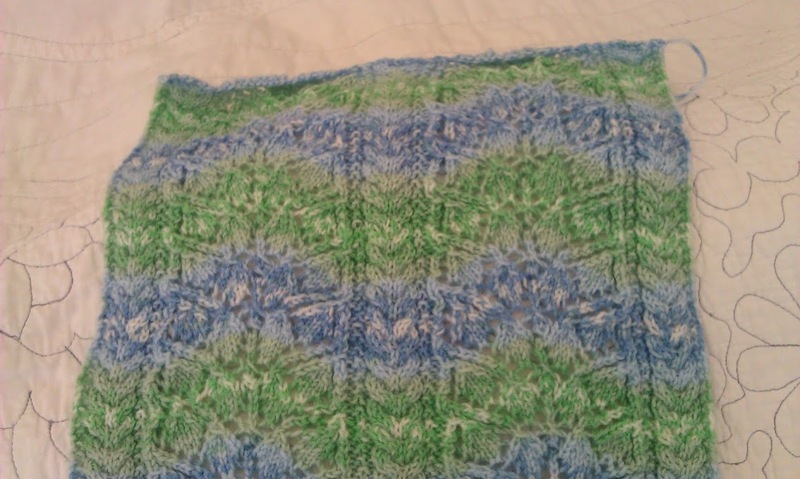 I like the leaf design, and my somewhat matching yarn is just the blue verigated with no greens…. I am thinking I will make it a tree row and then add a border. Half Done with the second side. Here’s a closer detail on the stitching. To be fair, I’ve had that project on the needles for some time, was working on it while traveling and just getting distracted and kept pulling out rows because I flubbed it up and then going back… but I’m finally making some solid forward progress. I am working on my second quilt. The original plan was a very hawaiian style quilt, as a gift to my grandmother. She used to go to Hawaii every winter with my grandfather. And I wanted her to know how much I think about her and worry about her even though I am the world’s worst letter writer (in the mailing it out dept). 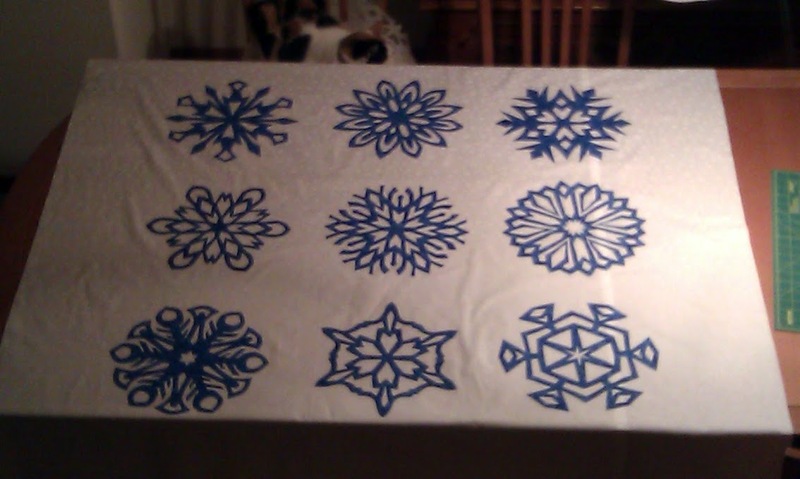 However, my quilt blocks aren’t super Hawaiian, and fall more toward the snowflakes realm of things… so its a snowflake quilt. I have all my flakes cut out and I’m currently appliquéing them on. Which has me all manner of sad, since the proprietor was the kindest and most helpful person in my quilting experiments. She always seemed sincerely interested in my quilting efforts, even though it was obvious the subject matter wasn’t familiar. So now.. my nearest fabric shop is once again.. at least 30 minutes away.